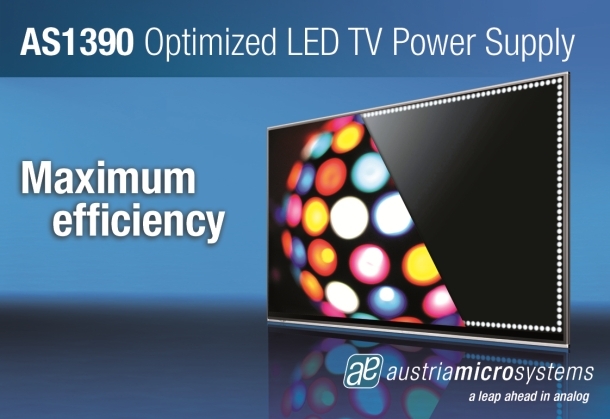 Unterpremstaetten, Austria, and Yokohama, Japan, (October 24, 2011) – austriamicrosystems (SIX: AMS), a leading global designer and manufacturer of high-performance analog ICs, today announced the release of the latest additions to the company’s comprehensive LED TV drivers and support IC portfolio. The new ICs include three LED drivers and a new LED power supply IC. These new devices plus other LED drivers will be demonstrated at the FPD International Exhibition & Convention, October 26 - 28, in Yokohama, Japan. austriamicrosystems will also be demonstrating the company’s complete ambient light sensor, proximity detection and color sensor product offering for HDTVs, tablets and mobile devices. The AS3822 & AS3823 are 6- and 8-channel LED driver ICs, respectively, and are fully compatible with the recently launched 16- and 12-channel AS3820 and AS3821 LED drivers. This compatibility enables set makers to use the same hardware design and software for their whole range of LED edge-lit TVs. All driver ICs in this portfolio employ austriamicrosystems enhanced digital power feedback control technique to achieve the lowest possible energy consumption. Additionally, smart dimming functionality further reduces power consumption while addressing the needs for the latest 3D TV designs and the highest picture quality. In addition to these new driver ICs, the new AS3810 16-channel LED driver with internal FETs is the 3rd generation of driver ICs for direct-lit TVs. It features industry leading channel-to-channel performance and all the functionality needed to optimize power consumption in large direct-lit TVs. Multiple ICs are easily combined to realize even dozens of dynamically dimmed backlighting segments, further reducing power consumption and fully supporting the best possible contrast. This full driver IC portfolio meets the design needs of all TV architectures with the highest current accuracy for the best light uniformity, the latest 3D features, and also reduced system cost. All of these driver ICs match perfectly with the new AS1390 combination boost controller / buck converter, which is optimized for the power needs of LED TV backlights. It supplies the LED backlight with a high-power constant-frequency boost controller optimized for up to 90 V/3 A combined with a 5 V/100 mA step-down converter to supply a microcontroller or other devices. In addition to offering special features for 3D, the AS1390 supports the needs of low energy consumption for LED TVs with over 95 % power efficiency. The continuous conduction mode of the AS1390 provides superior bandwidth and transient response. It also includes all required safety features, including over-voltage, over-current and over-temperature protection. In addition to this range of LED TV backlighting solutions, smart light sensors from TAOS, the leading global supplier of intelligent light sensors, were recently added to austriamicrosystems product portfolio. These devices significantly contribute to further reducing energy consumption through use of ambient light sensors to automatically adjust the screen brightness to suit the surrounding light environment. The AS3810, AS3822, AS3823 and AS1390 are all sampling. Contact austriamicrosystems for pricing.